“My rail will support me. Brazilian rail is everything. When they are screaming, and send me energy, good vibrations, I see and I smile for everybody. It’s so powerful … It’s not my dream come true, it’s my country’s dream come true.” — Bruno Politano. 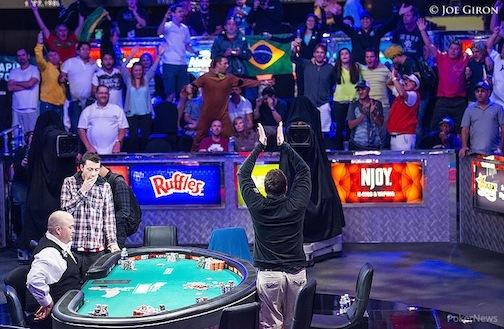 Brazilians have a reputation of being fanatics — take this past World Cup as an example — so it was no surprise to see those at the Rio All-Suite Hotel and Casino go nuts when 31-year-old Bruno Politano became the first Brazilian to make the World Series of Poker November Nine, albeit as the short stack with 12.125 million (though that is the “biggest” short stack since the November Nine was established in 2008). “When [Luis] Velador bowed out in 10th place a week ago, the Brazilians were ready, firing off confetti cannons and filling the Mothership with blue and green party paper. One of the supporters was even dressed like Scooby Doo(? 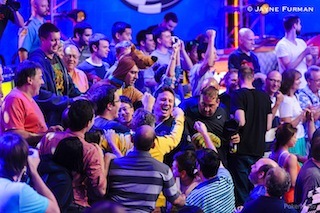 ), and all of the Brazilian contingent lifted Politano into the air and had him crowd surf around the ESPN stage. Come November, there is little doubt Politano will have the largest and loudest rail in the Penn & Teller Theater, and his early estimate is that he’ll be bringing 200 supporters with him. Born October 15, 1982, Politano is the pride and joy of Ceará, Brazil. Politano, who studied at Colégio 7 de Setembro in Fortaleza, Brazil, currently ranks 98th on the Brazilian all-time money list with $110,054 in live earnings (not including what he’ll take home for 2014 WSOP Main Event performance). His poker prowess comes as no surprise when you consider he’s friends with some of his homeland's best poker players, such as Andre Akkari, Felipe Ramos, Maria "Maridu" Mayrinck, and Thiago Decano. Prior to his deep run in the Main Event, Politano’s biggest cash was for $47,493 for a third-place finish in the 2013 Brazilian Series of Poker Main Event (BSOP) in Florianópolis. Other significant finishes include eighth in the Latin American Poker Tour IV Sao Paulo R$5,000 Main Event for $27,206 and seventh in the 2011 BSOP High Roller for $10,594. In 2011, Politano notched his first WSOP cash when he placed 148th in a $1,000 no-limit hold’em event for $2,548. In 2014, Politano returned to Las Vegas and earned two more cashes prior to the Main Event — 17th in Event #39: $3,000 No-Limit Hold’em for $20,148 and 135th in Event #58: $1,500 Mixed-Max No-Limit Hold’em for $2,708. As for his Main Event run, Politano began the Day 1c minefield as one of the many hopefuls in the field. He managed to finish in the 2,571 survivors as 474th in chips with 66,800, and then he was able to make it through Day 2c with 72,400 — good for 1,134th of 1,864 players. Politano chipped up slightly to 110,000 on Day 3, which put him 598th out of 746 players still alive. Politano’s patience paid off on Day 4 when he was able to increase his stack twentyfold to 2.289 million, which put him in fifth out of 291 players. He maintained his status on Day 5 as he chipped up to 5.475 million — good for fourth out of the advancing 79 players — and on Day 6, he navigated his way to the top 27, sixth in chips with 11.625 million. Unfortunately, the Brazilian was only able to add 500,000 to that number on Day 7, though it could have been much more had he played the final hand of the day. That hand occurred in Level 35 (200,000/400,000/50,000) when Politano opened for 900,000 in middle position and Mark Newhouse, who was seeking back-to-back November Nine appearances, called from the button. The last bracelet winner in the field, Luis Velador, then three-bet jammed for 6.15 million from the small blind. Politano tanked for approximately two minutes before folding what he later claimed was pocket tens, and then Newhouse thought for his fair share of time before making the call. The board ran out a clean , and Velador exited in 10th place while Newhouse chipped up to third in chips. Had Politano opted to play with his alleged pocket tens, he’d have collected Velador’s chips. Even so, the Brazilian is confident in his position. For more on the final hand, check out Chad Holloway’s analysis over on Learn.PokerNews.com. “I will play the EPTs, maybe the WSOP Australia, to make me comfortable for the November Nine, because nobody knows, but this bracelet is mine,” Politano said when asked what his plans are between now and November. Stay tuned to PokerNews as we follow Politano and the other 2014 November Niners leading up to the WSOP Main Event final table in November.